In contemplating the "Novus Ordo Missae" innovation of Communion in the hand, we must be aware that behind each and every disrespectful reception of the Holy Eucharist is always present a sacrilegious sin of disrespect to God's Infinite Presence, at least in comportment if not also in thought, word, and intention. Why sacrilegious disrespect is so relevant to Communion in the hand and not Communion on the tongue concerns the blatantly obvious abuses that have been recorded regarding this disobedient innovation ever since its inception in Catholic liturgy almost forty years ago. Every movement of our minds and our bodies in the liturgy, notwithstanding reception of the Most Holy Eucharist, ought to exhibit the utmost reverence to Almighty God in thought, word, and deed. And if our ecclesiastical behavior is not such, then it is either voluntary serious sin or venial sin and therefore of a sacrilegious nature for the lack of sacred comportment necessary at all times in God's Divine Presence, since we can be certain Our Lord's Own Mother and the holy Angel choirs themselves are known often to lie prostrate before His Infinite Presence. It is also clear that behind each and every Communion in the hand, at least objectively speaking, we can see satanical machinations at work, as Satan is the Great Imitator and master of egalitarian deception by making the bread of this world appear to be equal to the Bread of Heaven wherever he can. By receiving the most Holy Eucharist in the hand, instead of upon the tongue, it is suggested through this not Roman rubric of the "Novus Ordo Missae" that there is no difference between the two foods, the bread of this world and the Bread of Heaven, because we use our hands to receive both. Even the most inconspicuous or unintentional of irreverent oversights vis-a-vis the Unapproachable Perfection, Goodness, and Divine Purity that each Sacred Host deserves and contains, warrants a justifiable cry of sacrilegious outrage from every devout Catholic in the pews everywhere. In fact, so devious is satanical egalitarianism in this realm of making the Bread of Heaven appear to be just like the bread of this world that it has fooled so many, many Catholics to go along, including both laity and hierarchy alike. Moreover, the Great Imitator wants nothing less than to show his bread of this world, the mammon of iniquity, to be equal to the Bread of Heaven in every way. This he does whenever we agree to submit to Communion in the hand instead of Communion on the tongue, for the plague of irreverences accompanying this "Novus Ordo" ritual does exactly what Satan wants, having the Lord of the Universe to act as though He were Satan's equal by bowing down to Satan in exchange for the kingdoms of this world--one of the temptations of Christ in the desert. If Christ would have in any way acted this way, Satan wins, but Christ did not--not for a second would He as Our Divine Savior. But do not "Novus Ordo" Catholics fail miserably whenever they act as though the Heavenly Bread of Divine Perfection is just like common every day bread when in the "Novus Ordo Missae" they receive Communion or Heavenly Bread with their hands? This "Novus Ordo" innovation, even if done, subjectively, with good intention is still, objectively, an act of egregious disrespect to Almighty God's Admirable Presence, for it allows a host of sacrilegious behaviors to ensue; all because egalitarian Satan wants us to "act as though God weren't really present when we receive Communion in the hand." And we have just seen how St. Paul's sternest admonition of proper decorum and Roman rubrics is violated by Communion in the hand because "we are acting", as though the Body and Blood of Christ were not present or we are not "discerning the Body and Blood of Christ" and are therefore guilty of violating it in either a minor or serious way. Now what are these sacrileges, venial or serious sins, that this seemingly innocent "Novus Ordo Missae" rubric countenances with every single Communion in the hand? While even one such deed done, disrespectfully and knowingly, is certainly a mortal sin and a sacrilege at the same time, it is nevertheless too abundant, if only one. By the same token such liturgical oversights, if even venial, are likewise abundant if only done once in the entire world. But no, these violations are pandemic, not only venially but also mortally as sacrileges. Why? Because each and every time a liberal Catholic receives Communion in the hand, particles, flakes, or infinitesimal specs can and do fall from their hands on to the floor, no matter how careful or careless they may be when receiving the host from the priest, especially because the rubric of altar boys with patens has been a thing of the past since Communion in the hand's very innovation. Nor is anything done to clean up these egregious sacrileges, purposeful or not, when they obviously do occur by clergy, sacristans, or even the so-called extraordinary ministers of the Eucharist. Everybody, that is an observant Catholic these days, has seen these disgraceful and careless oversights whenever such liturgical mishaps do occur, with precious little or no effort at rescuing the Sacred Presence from further sacrilegious disgrace. This is an abomination in the House of God! This so seriously violates the Pauline rubric of Eucharistic reverence for clergy and communicants everywhere and always: to never act as though the Body and Blood of Christ were not present or to fail to discern the Body of Our Lord in Communion for as St. Paul says: "he who eateth and drinketh the Body and Blood of the Lord unworthily, eateth and drinketh judgment to himself." This one innovation of the "Novus Ordo Missae" is sufficient reason alone for any Church Council or Pope, reverently overseeing the sacred liturgy of the Most Holy Sacrifice of the Mass, to bring this erratic rubric to an end--and immediately-- if even one sacrilege of such a nature were to ever occur. But no! Nothing happens to change this abomination and Our Precious Lord's Body and Blood are sacrilegiously treated all over again by the brutality of a new pagan non-believing kind of Roman soldiers of another age and time. But, prayerfully, times are changing for the better. And this is a most powerful reason why especially the liberalization of the "Missa Latina Tridentina" at this time in history by Pope Benedict XVI, with its rubric of Communion on the tongue only, may be very beneficial in helping to end this debacle of the "Novus Ordo Missae" where irreverence and disrespectful sacrilegious behavior have been institutionalized into the very nature of the holiest part of the 'new mass' itself. 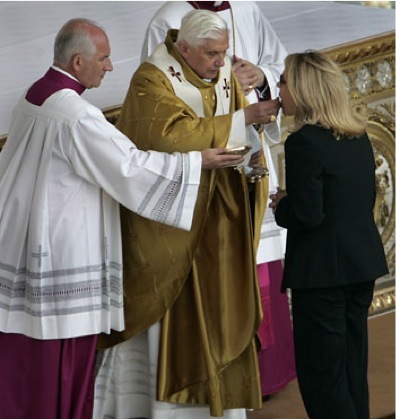 This is not to imply, infer, or hope that the abuse of Communion in the hand will not or should not be corrected by some special ruling from the Holy See by the current Roman pontiff, Pope Benedict XVI. The likelihood is most powerful that this abuse shall be corrected by this most devout Vicar of Christ for he is truly an Orthodox Roman Catholic pontiff with all we have seen him do thus far! But maybe, just maybe, he is far more strategic, and far more prudent and clairvoyant than most liberal or conservative Catholics these days could ever dare to have surmised. Let us all pray so, for this is the modus operandi of great saintly popes! 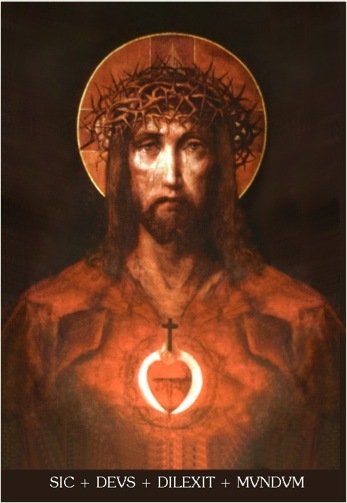 "A Prayer of Reparation to the Sacred Heart of Jesus in the Most Holy Eucharist"
I adore Thee in all the consecrated Hosts throughout the whole world and I return thanks for those who know Thee not, and who do not thank Thee. Would that I were able to give my life to make Thee known, loved, and honored by all, in this sacrament of love, and to prevent the irreverences and sacrileges that are committed against Thee in the Most Holy Eucharist everyday! I love Thee, Divine Jesus, and I desire to receive Thee with all the purity, love, and affection of Thy blessed Mother, and with the love and affection of Thy own most pure Heart. Grant, O Most Amiable Spouse of my soul, in coming to me in this most holy Sacrament, that I may receive all the graces and blessings which thou dost come to bestow on us, and let me rather die than receive Thee unworthily, not properly discerning Thy Presence in thought, word, and deed. Amen. Our Father, Hail Mary, Glory be to the Father, etc.